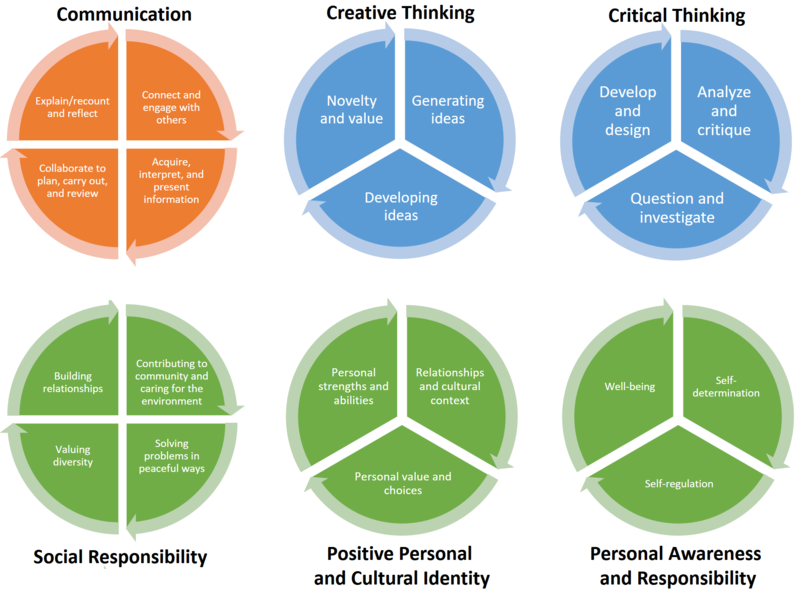 Core Competencies are the foundation to the Big Ideas, Curricular Competencies, and Content of our BC Curriculum. This foundation ensures that students are always mindful of their growth in the Core Competencies through self-reflection, self-assessment, and providing evidence of growth. Students come to the classroom with experiences and knowledge related to the Core Competencies. 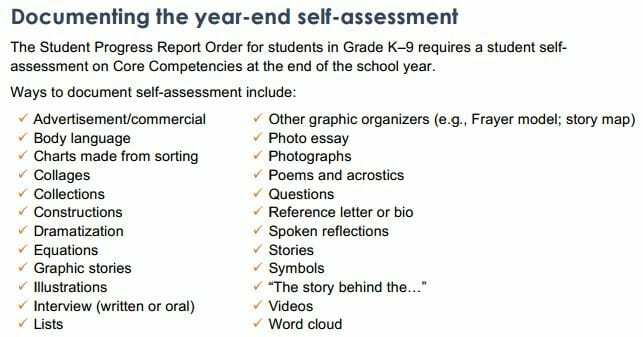 Self-assessment allows students to develop the ability to describe their learning in relation to the Core Competencies. They will set goals and gain greater ownership for their learning when they have the opportunity to self-assess and describe who they are as learners, document their progress, and share their accomplishments in an ongoing and holistic manner. The emphasis on self-assessment promotes personalization, inclusion, diversity, and student ownership of learning as it becomes a natural part of the learning process. Take a moment to read all of the competencies listed above. Now describe how the artifact you selected shows your strengths & growth in specific core competencies. Complete either the Self-Assessment (PDF) or Self-Assessment (Word) . The prompt questions on the left – or other self-assessment activities you may have done – may guide your reflection process. For more suggestions of Core Competency Prompts look at the sample questions below, they have been separated by each competency or CLICK HERE. How do you show that you are listening thoughtfully? What listening skills do you use to enhance your learning? What are some ways that you use to communicate your learning? What do you do when you disagree with someone in your group or discussion? How did you learn/develop that strategy? How does your artifact tie in with what you have learned before? How has your thinking changed? What made it change? Do you agree or disagree with this (statement, opinion, artifact or hypothesis)? What evidence is there to support your answer? What strategies do you use to decide whether to believe something you read? How did you develop these strategies? What advice would you give a younger student about figuring out what is true? How do you come up with ideas when you want to make something new at school or at home? Tell me about a time when you felt really good about a new idea you had. What helps you get new ideas? What make you want to get new idea or try something new? How do you use words and actions to encourage other students who might be feeling a bit sad or discouraged? What contribution have you made to our school that you feel good about? How did you get started doing that? What are your strengths as a learner and how do you learn best? What are some aspects that you value about your culture? What are some things about your culture that you would like other people to know? How do you use your strengths and abilities in your family, relationships, and community? Tell me about one of your learning goals. (Prompt: Something you want to get better at or learn how to do.) How did you come to that goal? Tell me about something you are doing to help you work on that goal? What do you do to help yourself when you are feeling a bit discouraged about your work? Think of times when you have to wait. What strategies do you use when you are feeling impatient? How did you develop that strategy? When did you start? How does it work? You will now attach and/or embed your self-assessment to the bottom of the blog post with the artifact you have chosen. You may choose to make this post private or public. After placing your artifact on a blog post, follow the instructions below. Tags – Now tag your post using the tag that corresponds to the competency that you have written about. You can choose more than one. Please use lower case letters and be exact. Use the Add Document button located at the top of your post page and embed your self-assessment at the bottom of your blog post.